It was 2011 when I visited the wonderful city of Ptuj for the first time in order to study the Poetovio-fragments for my PhD project on the acoustic and mechanical systems of the doublepipes from the Roman Empire period. I was especially interested in their organology, that means in their construction, trying to understand the different types of mechanisms present on the instrument. Apart from that I immediately started looking for any indications for the original order of the nowadays separate fragments of the pipes. During this study I was tremendously supported by a wonderful and extremely helpful team from the Ptuj Regional Museum (Pokrajinski Muzej Ptuj Ormož ), Tatjana Štefanič, Darja Koter and Boris Farič, who made professional photographs, and also by my husband Adje Both. Then, the EMAP started and the reconstruction of the Poetovio tibia could not be missing in the “Archaeomusica” exhibition, especially as the exhibition was going to be shown in Slovenia. The Poetovio tibia is, next to the possible Neanderthal flute from Djive Babe, the most significant archaeological musical instrument found in Slovenia so far. The reconstruction project became a reality and I could continue my work together with the great researchers and instrument makers related to the EMAP – my personal dream team – Peter Holmes from London and Stefan Hagel from Vienna. Peter was the one who in fact produced the first reconstruction of the instrument seen on the photo below. Stefan, in turn, was involved in creating the design of the reconstruction. He enriched my organological interpretation by the use of his dedicated software for auloi/tibiae reconstructions, which gave the reassembly of the instrument fragments another dimension – he interpreted the instrument fragments according to nowadays knowledge on the ancient Graeco-Roman musical system. Stefan also created the .stl files for each of the pipes, so that we were able to print them out and check them before starting the production from bone and metal. The print out was done at the Middlesex University London (one of the EMAP’s associated partner) with the great support of Neil ‘Spike’ Melton. Peter, Stefan and I are working currently on the design for Poetovio tibia II, so the instrument reconstruction will soon achive another level of maturity. Keep your fingers crossed! Tibia from Poetovio (Ptuj, Slovenia), 2nd or 3rd century AD, Pokrajinski Muzej Ptuj Ormož. 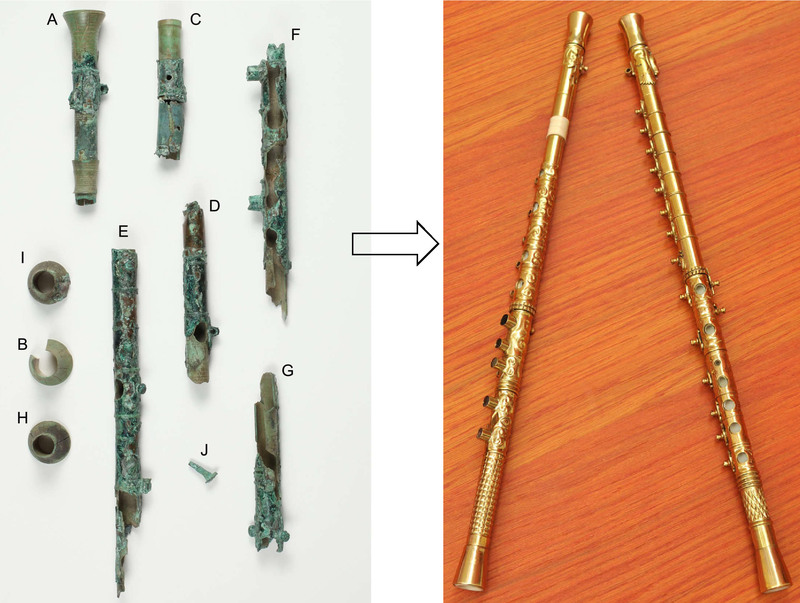 Photo on the left: the original fragments of the instruments; © Boris Farič and Olga Sutkowska. Photo on the right: preliminary reconstruction of the Poetovio fragments made by Dr Peter Holmes according to his and Olga Sutkowska’s measurements, Olga’s organological research, and the reassembly idea of Dr Stefan Hagel; the reconstruction project has been coordinated by Olga on behalf of the EMAP; © Olga Sutkowska. This entry was posted in Poetovio tibia and tagged mechanisms, reconstruction. Bookmark the permalink. Olga is giving an illustrated talk on the Poetovio tibia at the 1st Euterpe doublepipe school, Saturday 5 May 2018, 17:00, Hotel Velcamare, Tarquinia. For those who can’t join us, this will be filmed for YouTube together with the other Euterpe lectures. For the full programme, see http://www.emaproject.eu/events/euterpe.